Walk The Line is fast approaching. Don’t miss your chance to take part in 2015. 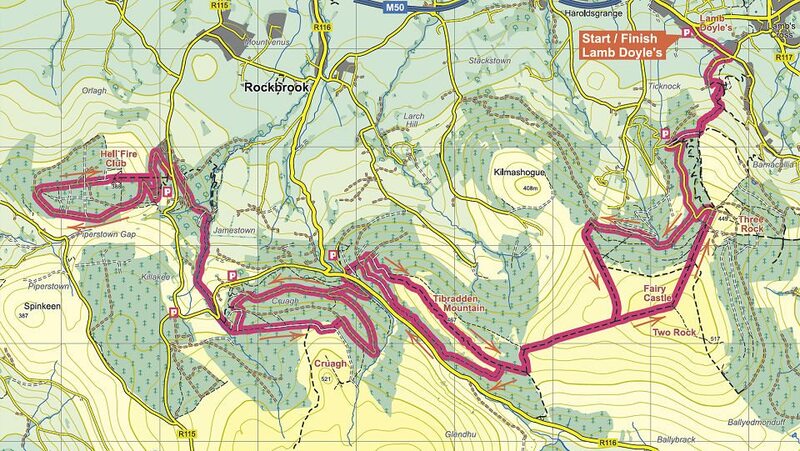 A cracking new route in the Dublin Mountains that offers challenge, spookiness and history in equal measure. A benighted visit to the Hellfire Club could leave you in an altered state but you’ll be feeling good when you realise the proceeds go to the Dublin Wicklow Mountain Rescue Team. The challenge will be starting and finishing in Lamb Doyles pub for easy access and offers a long(32km) and short(16km) route so it really is open to everyone. People love the experience of walking into darkness so we have also brought the event forward to March 28th this year so you can do just that safe in the knowledge that Dublin Wicklow Mountain Rescue Team will be there to help you along. There will be plenty of challenge and interest on the new route with some mountain sized ups and downs and some fabulous views of Dublin that you may never have seen before to distract from the effort. Your continued support will help keep the Dublin Wicklow Mountain Rescue Team on call in our beautiful countryside so we can continue to save lives and come to the aid of people like you in wild and remote places. The €100 euro amount you are required to raise (which is inclusive of your registration fee) goes directly to the team with the current focus on fundraising being to find a much needed base for the team. All of our members are 100% volunteers so literally every cent of your fundraising effort will go to helping save lives in wild and remote places.